Tonight’s Guest editorial is from Pietenpol builder Terry Hand. Terry was motivated to write this by attending several Corvair events and watching many of the builders present share their expertise with other builders. Previously I have written about different entry points into experimental aviation. Terry is arriving from a long professional background of a USMC/ATP experience. As he relates, some of this directly applies to experimental building and flying, and some does not. In a story last week I commented on arrivals from other branches of aviation already understanding the ‘rules.’ The following piece is Terry’s contribution to his fellow builders, bringing some perspectives from his other lives in aviation. Like our other editorials, I encourage builders to cover their thoughts in 2 or 3 thousand words. In most communication places on the web, this would be a titanically long piece. However, I am not running this site so that we see how brief exchanges can be. important topics should be covered in more than bumper sticker slogan depth. This is not the trend in our industry. For 10 years there has been a move toward the 400 word story. Even EAA publications had an in-house memo stating that they would never publish a story that was 1,500 words again, even on-line. This was a concession to data that showed the new marketing target was a generation of people bred by tv and the internet to have very short attention spans, and they “didn’t like reading about concepts nor details.” Does that sound like the kind of people we need more of in flying? Have no worries, people like that don’t get far in flying and they are easy to steer clear of. When planning and decision making, always plan for the worst to occur. If bad things don’t happen – you sleep well at night. If bad things do happen – you were ready. Let me give you an example. When I flew helicopters, I learned very early on not to fly from Point A to Point B. Rather, I learned to fly from Point A to a farmer’s field (one I could autorotate to and land on in the event of a catastrophic failure of some kind) to another field, to a parking lot, to a football field, and then to another field, on my way to Point B. It was the philosophy that, if a catastrophic failure occurred, I had choices and had a good chance of surviving. How does this apply to building my airplane? 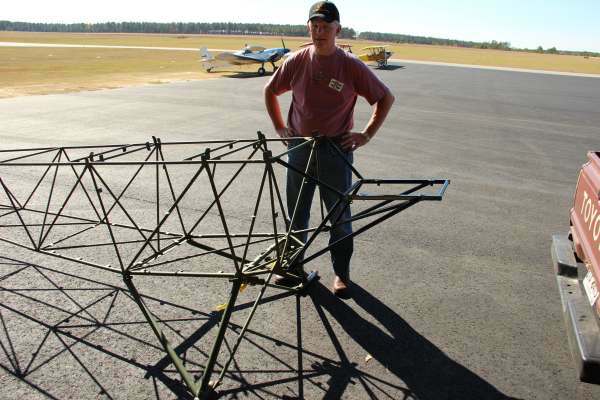 If the plans call for aviation quality plywood for building gussets, and you find a good price on some plywood at the local big-box store, stop building and go get the right material. Do not assume that it is probably okay to use that plywood.Plan for the worst. In another example, that is why I won’t route any fuel lines through the cockpit area and I won’t use plastic fish tank tubing for my fuel system. If I spend a few extra bucks and buy quality fuel line materials and fittings and never make an off-field landing – I sleep well at night. If It does happen, and my gear collapses, or the aircraft suddenly comes to a crashing halt – I am much more likely to avoid fuel leaking and causing a catastrophic fire. Skills may be similar, but they are not always equal. In my commercial aviation career I have flown everything from the 737-200 to the large 767-400ER. In the course of my career I flew for several years as a co-pilot on the Boeing 727. What a great airplane! We use to jokingly say that you could probably hit the Outer Marker on an ILS approach at 250 knots and still be able to slow down and configure the airplane for landing by the time you got to the runway. I am not sure it was a true statement, but it wasn’t far off. Pull the power off, and man could that airplane slow down! Contrast that with the 757/767 series of aircraft that are extremely clean aerodynamically. Especially the updated 757‘s with winglets. We often tell the controllers when they request a steep descent along with a speed reduction, “I can slow down, or I can go down, but I can’t do both.” If you tried to fly the 757 in the same manner as you flew the 727, you would always be high and fast on approaches. Yes, they are both airplanes (and Boeing products at that), but the skills required to fly them are different. The same is true with skills we bring to building our aircraft. You may be a gear head from your teenage years (I certainly wish I was), but the ability to tear down a rebuild an auto engine is nowhere near equal to building a Corvair. To equate the two and the knowledge and decision-making required is to run the risk of hurting yourself or someone else by building an engine that may be roadworthy, but not airworthy. The skills may be similar but not equal. Listen to experience, and don’t try to blaze new trails. Trust me, you are not the first guy to come up with that idea. When I was an instructor in Pensacola, we taught from an extremely standardized syllabus, one that allowed us to evaluate all students against a known training standard. Every once in a while a new instructor would arrive, and he just KNEW that his way of teaching a skidded turn stall recovery or an emergency landing was just a little bit better than “the Navy way.” While it was admirable that he wanted to improve the syllabus, usually his way was a way that had been studied, evaluated, and found to not work as well as the approved method. And usually his way didn’t teach the student as well as the approved method and the students training actually suffered as a result. So how does that apply to building an airplane? Are you using AC 43.13 as your road map of acceptable construction methods? Or have you decided that it only applies to certificated aircraft, and you don’t need it. In reading The Corvair Manual, do you find things that you are doing to be at odds with what the manual has told you is the tried and tested method of doing things? Blazing a new trail usually isn’t new, and don’t be surprised if you get stuck by some thorns while blazing that “new” trail. Footnotes and warnings are often written in blood. Don’t add yours. In the world of Naval Aviation, our POH was referred to as ‘“the NATOPS Manual” (short for Naval Aviation Training and Operations Procedures Standardization, a real mouth full, so NATOPS was just easier to say). All through the NATOPS manual were highlighted cautions, warnings and footnotes. When I was a student, I had an Instructor in Pensacola teach me early on when he said, “Read and heed those warnings. Most of them are written in blood.” What he meant was most of those warnings were added after some pilot had done something wrong in operating the aircraft that either damaged the aircraft, injured or killed someone, or had done both. How does this apply to our discussion? I look at my Corvair Manual as the “NATOPS manual” of building and maintaining my engine. If it tells me not to do something, there is most likely a story behind that warning. Maybe it is the story of an engine being built incorrectly and causing undue expense or delays in the building process, or worse, damage to the aircraft or pilot. Standardization does not inhibit freedom. It enhances it safety. I have spent the lion’s share of my flying career in jobs with numbers of checklists and standardized procedures. I used to think that checklists were sometimes excessive and prevented me from “being an individual” (whatever that means). Real men don’t need checklists, do they? I felt that they made me just a robot pilot like all other robot pilots. Then I came to this revelation when I was a 767 instructor many years into my flying career. The purpose of checklists was not to make you a robot or take away your freedom. Rather, it was to identify the big stuff – the stuff that would kill you. The checklist helped you to take care of those items, then gave you the freedom to fly within those boundaries set by the checklists. Think of it this way in your own flying. Look at the checklist you use in flying any airplane. Read the checklist and leave an item out and ask yourself, “If this step was not part of the checklist and I forgot to do it, what is the worst thing that could happen?” Refer back to Point 1 above. So how does this apply to building? Again, I refer to the instruction provided by the Corvair Manual, fly corvair.com and flycorvair.net. Those documents and writings may not be formal checklists of how to build and maintain your engine, but they are pretty darn close. Use those checklists to avoid that things that can hurt you, thus leaving you the freedom to build your engine your way in the areas left to your discretion. Practice, Practice, Practice. I have been in a training environment for a large portion of my flying career. I can remember as a student in Pensacola spending time in cockpit procedures trainers (non-moving simulators) as well as full motion simulators practicing my checklists, start procedures, maneuvers, and emergency procedures long before I ever set foot in an airplane. The practice made my flying better, and the end product (me, as a pilot) was better than if I had just tried to learn as I went along. That training has continued through today. I go in a simulator twice a year to practice procedures. What does that have to do with building? As an example, if you are a non-welder (like me), don’t let your first welds be your landing gear! Practice welding, or gluing wing ribs, or making connectors for your electrical system, or any of a host of other skills necessary in building your airplane until you are satisfied with the quality of the work before you ever do the same work on your actual airplane. Don’t be in a hurry to build. Many times people jump into a new phase of construction and try and learn “on the fly” (no pun intended). Aviation will kill you if your work is not quality work. Look at every joint, every weld, and every part of construction as if your life depended on it, because it does. I hope that some of these principles may cause you to think, or even rethink the way that you are planning or building your aircraft. I am sure someone (or maybe many people) are thinking, “What is this guy talking about? This is not military aviation or commercial aviation, or even general aviation. This is experimental aviation. I can do as I see fit.” Did you notice the same one word used four times? Aviation. It is all aviation, and the same principles carry across all of aviation (refer to the quote at the beginning of this writing). These principles can help you or hurt you, depending on how you respond. One Response to Guest Editorial, Pietenpol builder Terry Hand.